Okay, so this is not your typical view of Mars. You’re used to the HiRiSE images we show on the site, but the above figure is Mars too. We’ll it’s a spectrum of the upper atmosphere taken by some of the Galaxy Zoo lot , a little over a week ago. I’m collaborating wit them to look at a sample of blue elliptical galaxies in the submillimeter using the aptly named Caltech Submillimeter Observatory (CSO) equipped with the Leighton telescope. It’s a 10.4-m single dish telescope located on the summit of Mauna Kea in Hawaii. I’ve observed with it remotely, but Chris Lintott, Becky Smethurst, and Sandor Kruk from the University of Oxford, and Ed Paget from the Adler Planetarium went up the mountain for this run. Ed’s written an account of the trip that you might be interested in reading: Night 1, Night 2, Night 3, Night 4, Night 5, Night 6. As a planetary astronomer I’ve pointed telescopes before, but I’ve observed in the optical and mid-infrared wavelengths using a big hunk of polished glass to collection the photons. This observing project is the first time I’ve ever observed in the submillimeter and used a dish telescope. The aim of this project is to look at the carbon monoxide (CO) in blue elliptical galaxies and see what it says about star formation. We’re actually looking at in particular (2-1) rotational electron transition of the CO molecule. This transition occurs in the rest frame of the gas at 230 GHz, wavelengths where our eyes are not sensitive. 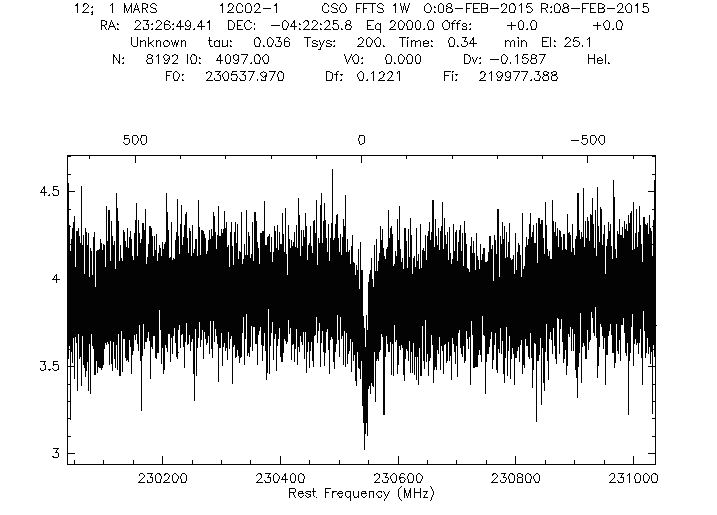 Turns out that the CSO uses Mars as a frequent calibrator and pointing target for the Leighton telescope. The first time I pointed the telescope back last July when we had observing time was the first time I’ve ever observed Mars, and it was just to check the pointing! There’s a lot of carbon dioxide (CO2), as you know. 30% of Mars’ atmosphere condenses out into the slab of CO2 ice in the winter on the South pole that the geysers (and as a result the seasonal fans) will be spawned from. There’s also a lot of CO. CO in Mars’ atmosphere was detected and observed in the submillimeter.back in the 1960s ad 1970s. The result is a strong absorption feature when you observe the disk of Mars and its atmosphere. You can use it to step the beam across as you tune the telescope and find the optimized pointing that gives you the strongest signal (and thus best pointing). So nightly the Galaxy Zoo gang were using Mars for calibration observations at the start of their nightly observations. It’s a very different use for Mars’ atmosphere, but there is useful info in the spectrum you can extract about the state of the Martian atmosphere. The width of the line and depth tell you about the global amount of CO and the global average wind speeds. The guess from the Galaxy Zoo lot that night was that they were seeing something on the order of 10 km/s winds. With Planet Four, we’ll also be getting estimates of the wind speeds on Mars, but from the bottom of the atmosphere at the boundary layer that meets the surface. So we’ll be probing a different regime that what the can be studied in the submillimeter. Assuming a particle size, the length of the fans can tell us the strength of the wind. The direction the fan is pointing in gives the direction that the wind is heading in. We’ll be able to compare those velocities and directions we extract from you markings to that produced by global climate models of the Martian atmosphere.